Re:Request that you do rigorous due diligence to ensure your institution’s funds are not invested in land grabbing/ agro-colonialism in Africa. Re: Request that you do rigorous due diligence to ensure your institution’s funds are not invested in land grabbing/ agro-colonialism in Africa. We are Africa Faith & Justice Network (AFJN), a Catholic advocacy organization that is inspired by the Gospel and informed by Catholic Social Teaching. AFJN seeks to educate and advocate for just relations with Africa and works in partnership with African peoples as they engage in the struggle for justice, peace, and the integrity of creation. 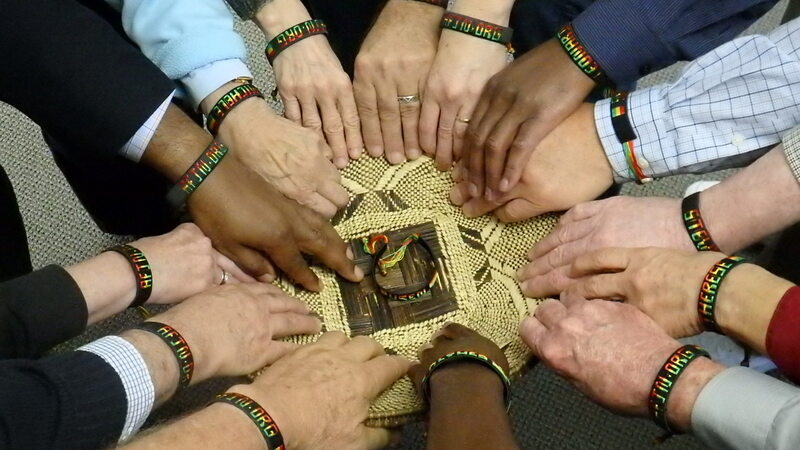 The organization’s founders and members are Catholic religious communities of men and women as well as individuals passionate about the common good for the people of Africa. Why are we reaching out to you? Africa is undergoing a new form of colonization – agro-colonialism, also known as land grabbing. This new scramble for Africa is more dangerous than the partitioning and colonization of Africa which followed the Berlin conference of 1885. Today, farmlands and minerals are the biggest attraction in Africa and new players have emerged. Land scarcity in many corners of the world, desertification, the increased world population, the current and predicted rising costs of food and the growing demand for biofuel and mineral resources have enticed multinational corporations and sovereign nations to engage in irresponsible land deals which have become a new form colonization in developing countries, particularly countries in Africa. We need your help as a prominent university to ensure this does not continue to happen. What is happening to affected people and communities? Land grabbing has a decidedly harmful impact on the people of Africa. It leads to displacement of families and communities, conflict, exploitation, starvation, halted development, disenfranchisement for women, environmental degradation, loss of indigenous crops and seeds, deforestation and pollution of water sources oftentimes using prohibited fertilizers, herbicides and pesticides. When land is leased, those who live on the land are usually relocated to less arable areas, prohibited from accessing the land they once owned, either to fetch water, gather firewood, collect herbal medicine, gather sand for building their homes, access the graves of their loved ones, or simply denied passage to get to their other farms and are thus forced to take long detours. These interactions oftentimes result in conflicts in communities that were otherwise at peace. The majority of produce from Africa’s acquired lands is shipped to developed countries, with little if any going to local markets, and some of these corporations lease lands exclusively to plant cash crops. Yet, the public discourse is that they are producing food to alleviate hunger for starving Africans. The most affected are small scale farmers who make up the majority of the workforce. As a consequence, many families are deprived of their source of sustenance. These are the ones we are asking you to join us in protecting. They include women and their families. In 2015, Deepsin Implex Limited out of India leased land in Ghana’s Volta Region from chiefs in the Dorfor and Battor traditional areas who did not inform their communities to whom the land belonged. The lease says that those living on the land will be relocated, but they did not say where. We were in these communities in February of 2017. Those we met with told us that they have been fighting to get their land released from the lease, but it has proven nearly impossible. In September 2009 when SG Sustainable Oils Cameroon PLC, a subsidiary of the US-based agribusiness Herakles Farms, leased land in Mundemba in South West Cameroon, it went to the Cameroonian government and received approval for 73,086 hectares (180,599.4 acres) of land, close to four times the size of Washington, DC, for a term of 99 years renewable once. The contract states that the company “shall pay annual surface rent to Government of US $1.00 [500 FCFA] per hectare for State Land that is Developed Land, and US $0.50 [250 FCFA] per hectare for State Land that is not Developed Land per year.” For reference, one hectare equals 2.4 acres. Cameroonian farmers were shut out of the process. The company engaged in bribery and forgery of signatures of local leaders and unwilling traditional chiefs to lease their land. The Africa Faith & Justice Network, along with other organizations, joined hands with local communities to bring the impact and long term implications of the contract to the public, investors and the government, leading the President of Cameroon to sign on November 25, 2013, a series of decrees which modified the original land size and instead granted the company a three year provisional land lease of 19,840 hectares (48,136.1 acres). The fight against this contract has landed land rights and environmental protection activists such as Nasako Besingi in prison, and the litigation to intimidate and bankrupt them is ongoing as of this writing. In Ghana’s Volta region in 2009, the same company under the name SG Sustainable Ghana Limited leased more than 3,000 Hectares of land for $5 per year per hectare in what was clearly an outright deception of the people. It later sold the acquired land to a British agribusiness called Volta Red. Our organization has visited these communities several times and received firsthand account of what happened. The landowners never read the lease before signing it at a hotel where they were invited, entertained, fed, and served drinks before asking them to sign the contract for land lease which was well crafted by Herakles Farms with a calculated disadvantage to the community. No surprise that section 12.3 says that in case of dispute over the lease agreement, “the arbitration shall be conducted in Paris, France and,….The arbitration agreement contained in this section 12.3 shall be governed by and constructed in accordance with the laws of France” (p. 37). How can a farmer in Ghana who has a hard time paying school fees for his or her children afford to bring a case to a court in Paris, France for arbitration? This is one of many deceptive tactics companies like Herakles Farms use to disempower vulnerable communities and take their land. These examples mentioned are just a few out of literally hundreds of bad land deals taking place on the African continent. However, we do not intend to heap all the blame on foreign corporations. The process of land grab is facilitated by local African leaders who mortgage the resources and the heritage of their people for fleeting gains. Most are not accountable to their citizens and do not work for the common good; rather, they live like kings on the back the population, transferring public money to bank accounts in foreign countries and ensuring they stay in power for decades. How are US universities involved? In “US universities in Africa ‘land grab,’” published in August 2011, The Guardian reported that “Harvard, Vanderbilt and many other US colleges with large endowment funds have invested heavily in African land in the past few years. Much of the money is said to be channeled through London-based Emergent asset management, which runs one of Africa’s largest land acquisition funds, run by former JP Morgan and Goldman Sachs currency dealers.” In its press release on February 13, 2013, titled “Betting on World Agriculture. US Private Equity Managers Eye Agricultural Returns,” Oakland Institute noted that Vanderbilt divested “$26 million investment in EMVest, formerly Emergent Asset Management, an agricultural corporation with farms in five sub-Saharan African countries, including Mozambique, South Africa, Swaziland, Zambia, and Zimbabwe and whose investors included Harvard University.” These investments are happening more often than they are reported on, and many universities are unaware that the financial institutions they are invested in are committing these actions. How are financial institutions involved? Financial institutions play a large part in this process as they provide money for corporations to invest in farmland for high returns. Some analysts have noted that there seems to be a systematic takeover of natural resources from developing countries as part of global restructuring to ensure continuous supply of goods and raw materials needed in the developed countries. This is not unfounded. Current land tenure policies are being driven by the World Bank – particularly through its Doing Business (DB) ranking system – the International Monetary Fund and multinationals to make land grabbing easy for large scale agriculture at the expense of the small scale farmer who provides more than 70% of Africa’s food supply. What actions are we asking you take? As you examine the harm land grabbing causes for the people of Africa and the world, we hope you will stand with the poor and vulnerable in their efforts to stop land grabbing. We urge you to take the necessary steps to ensure that your resources are not invested in corporations involved in land grabbing. We humbly request that you do rigorous due diligence to ensure your institution’s funds are not invested in land grabbing. For your convenience, we have attached a list of United States investors that are involved in land grabbing in Africa. May God bless you and guide you in your work.